During a recent conversation with the wonderful Linda Urban, we agreed that we’ve developed main characters that display traits and characteristics similar to our own. Though we have never experienced the same trials as our protagonists, we feel what they feel and understand how they react to those trials because part of us would react in the same way. Lizzie is a just-turned-twelve-years-old girl navigating the tribulations of the Great Depression alone. (Or so she believes…) By contrast, I am a just-turned-thirty-three-years-old writer navigating the trials of Authordom with the aid of many kind souls. (Thank goodness for that!) So what in the world could we have in common? It just so happens that the same personality flaws that hinder Lizzie on her path to stop herself and her mother from losing everything, including each other, are the same personality flaws that I struggle to overcome as I traverse the path to publication and the drafting of my next book. I know, I know. I’m not supposed to believe I have any flaws. But truthfully, I’m painfully aware of my flaws from sunup to sundown, day in and day out. What are they? I pick apart each tiny thing that relates to my writing. For example, I am an unrelenting pre-plotter. Why? Perfectionism makes me a control freak. I must know what is going to happen and when (at least the large plot points). I have to see it outlined, study it, critique it, ponder it, and then, and only then, can I begin to write actual words. I need to know my characters, hear their voices, see them walking around and interacting with one another inside their world. I’d give anything to be one of those blessed writers able to take a concept and produce a first draft in a matter of weeks. But I am not. I hammer out a first draft over the course of a couple of months, each day returning to what I wrote the day before to polish sentences and clarify themes and motivations. It is a long and arduous process fueled by perfectionism. This can be good or bad. Before Every Day After was acquired, my stubborn personality was good. I refused take no for an answer. I believed in Lizzie’s story, and I wasn’t about to give up on it. End result: perfect editor and impeding publication. But now that I’m working on Book 2, this characteristic has displayed its ugly side. Once I get an idea or a character inside my head, I can’t give up on it until it has been fully realized. I feel like giving up on an idea would be a type of failure. Again, the whole perfectionist bit. Recently my editor and I had a phone conversation during which we mutually agreed that it would be best to put my then WIP aside and work on a book more like Every Day After. I had been pulling out hair and teeth in desperate attempts to make the project work. The project had wrestled me into a severe case of writer’s block. Now that I have moved on to a new project, I feel a renewed passion for story and writing. Still, before I hung up the phone I told my editor that after I’d completed this manuscript, I would try to tackle the difficult one yet again. I’m too stubborn to let it go. It bothers me. There’s a challenge to be had in making it work, and I intend to come out the victor. I am my worst critic. Occasionally, this causes me to shut down. Perfectionism also feeds self-criticism. I want everything I do to be perfect, and I get frustrated with myself when it’s not. Anne Lamott talks about silencing our inner editor in her brilliant book Bird by Bird. This is something I struggle with each time I sit in front of the keyboard—whether in pre-plotting or actual writing. Every decision, each word, is up against Ms. Self-Critic. Shutting her up is a full time job. Lizzie displays all these traits—many spurred on by her father. (Note: my own father was not this way.) She refuses to let herself fail, and in so doing she becomes hyper-focused on her own problems, just as I do more times than I would like to admit, because once I finally make it into “writer mode” it becomes all too easy to tune out family and friends. Sad but true. What about you? What traits—good or bad—do you share with your main characters? Do you struggle to overcome in life what you allow your characters to overcome in fiction? If I’ve learned one thing though writing it’s that life is harder than fiction. Laura Golden is the author of EVERY DAY AFTER, a middle grade novel about a young girl learning to let go and find her own way amidst the trials of the Great Depression. It will release on June 11 from Delacorte Press/RHCB and can be pre-ordered through your favorite independent bookseller or online retailer. Find out more about Laura and EVERY DAY AFTER by visiting her website or following her on Twitter and Facebook. If Twitter was around in 1523 (the year the narrative of TARNISH begins), what would be on the trending topics list? What would people have been thinking, discussing, wearing? Treason—throughout Henry’s reign, this would have been a trending topic. In 1521, he had the Duke of Buckingham executed for alleged pretensions to the throne. In 1547 (right before he died) he had the Earl of Surrey beheaded for the same. Not to mention all the wives, advisers, relatives and courtiers in between. Humanism (and Classicism)—the trend throughout Renaissance Europe (at least amongst the elite and educated) was from focus on religious scholasticism to the philosophy of ancient Greece and Rome. This, in turn, led to more autonomous thought and the kinds of philosophical discussions that these days only occur in ethics classes and late night dorm room drinking sessions. Religious Reform—In the 16th century, there was a movement for the average (educated) person to form her own opinions about religion—to read religious tracts and even the Bible in her own language. This desire to understand the workings of faith led to a desire to have more control of it instead of having faith dictated and rigidly imposed. 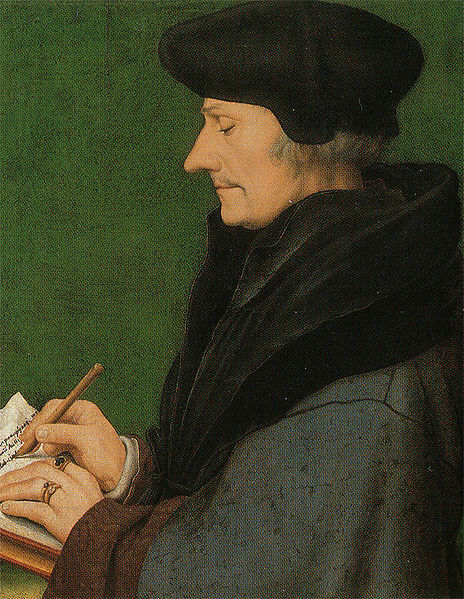 War (usually with the French)—Henry had hawkish political policies. He wanted to recover the lands captured by his ancestor, Henry V. He had to maintain English control of Ireland. The Holy Lands (and even parts of Europe) needed to be rid of the infidel. And Northern England always needed protection from the Scots. Even when he was signing peace treaties, he could be scheming ways to break them, and an enemy could be an ally given the right conditions. Fashion—almost since the invention of clothes, fashion has been trending. In the Tudor era, it was fashionable for women to wear several layers of skirts, tight, buckram-stiffened bodices and long sleeves. In England, they wore large hoods with stiffened gables (like a series of peaks from a baseball cap) around their faces. Anne Boleyn helped bring into fashion the French hood—set smooth against the head and further back from the face, revealing an expanse of hair thought to be somewhat risqué. Men wore padded doublets with wide shoulders to accentuate the chest, sleeves with “slashings” revealing a second layer of color beneath them, “hose”, and often a surcoat with a thigh-length skirt. This was also the era of the codpiece, meant to cover and accentuate (ahem) other parts of the anatomy. Love—There wasn’t much time or scope for romantic love for the average person in medieval or early modern England. But the Tudor court was fascinated by the ancient stories (King Arthur, Tristan and Isolde, etc.) and “courtly love”—a supposedly chaste form of flirting. Henry, of course, raised this idea to new levels by marrying (5 times out of 6) for love. Would other people—aristocracy or not—begin to want the same? These days in the Western world, it’s expected that we will marry for love. What was once an unusual trend (religious reform, self-determination, romantic love) has now become the norm. Thankfully, some trends (beheading your friends, codpieces) have not. What do you suppose the trends of today will give the future? Our assignment this week is to write about something in our writing process that’s surprised us. My favorite thing about writing is the surprises – the little clicks when something comes together or when you discover a trail of breadcrumbs that your subconscious has been dropping for you or when a minor character suddenly becomes more important to the story than you’d planned. It’s that last twist that I wanted to explore today – the way an ensemble member suddenly roars onto the stage, all Technicolor, and you can’t imagine the story without them anymore. When I started writing BORN WICKED, I didn’t realize that Sachi Ishida and Rory Elliott would be more than empty-headed, superficial town girls. They’d make easy antagonists for Cate. But then I thought, hmm. Cate – a bit of a tomboy who enjoys climbing trees, running through the fields, or gardening more than shopping – is really judgy about girls who like dresses and fashion and are more traditionally girly. Wouldn’t it be interesting to explode that stereotype – to give Sachi and Rory their own secrets and an unexpected canniness? My editor suggested that Sachi and Rory remain antagonists – perhaps rivals for Finn’s attention, or enemies who would betray Cate in some way. But it was super important to me that Cate find girl friends.That she grow to respect and trust and sacrifice for them. One of her biggest arcs, to me, is the discovery that she can trust girls who aren’t her sisters, and that the family you create from friends may be as strong as the family you’re born into. She and Sachi form a quick, close bond over their fierce loyalty to their reckless sisters. And Rory – well, Rory Elliott has become one of my favorite characters to write – possibly my very favorite after Cate and her sisters. In STAR CURSED, when Rory gets the chance to confront the father who’s never acknowledged her as his, it’s one of my favorite scenes. Throughout BW, Cate continues to underestimate Rory – to judge her as reckless and slutty – and it’s only in that moment midway through SC that she realizes Rory has her own strengths and isn’t nearly as oblivious as she’d imagined. I think the only thing more fun than surprising yourself is surprising your protagonist! I started this post three different times. I’ve been doing that a lot lately. 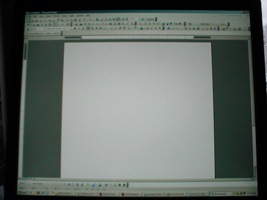 Writing the first few words of a post, then deleting it and squinting at a blank page. I’ve been blogging over at LiveJournal since early 2004. Originally I planned to stick more or less to writing, but in addition to book angst over the years I’ve discussed two surgeries, one cross-country move, four years of grad school at two different programs and countless amusing anecdotes about my kid, most notably when he dropped trou in the cafeteria and instigated a worker’s rebellion in Language Arts. And while I’ve always been fairly circumspect about what I post, lately I’ve been redacting before I’ve even written anything. And it’s not so much the content I’ve been scrutinizing. It’s the tone. It’s easy to suss out what not to say on a blog. Don’t be a jerk is a good rule of thumb if you’re not sure. Those are the easy decisions to make. What’s trickier is knowing how to present certain events in a way that keeps you on the right side of the line between heartwarming details that humanize the working writer and dude that’s TMI. The state of your WIP, for instance. Once upon a time I might have posted Man, am I feeling crappy about this revision or This whole scene is weak as hell, but ever since The Wicked and the Just sold (such less came out), I’ve been second-guessing things that aren’t glowing and rosy. On the flipside, if you’re always all upbeat and Pollyanna, aspiring writers struggling with their own work may be offput by what they see as 1) hubris or 2) the effortless crafting of salable prose. Not to mention the intellectual dishonesty of not presenting writing with all its warts. And what about some personal disaster? How much do you post about things like losing your mother-in-law or your basement flooding before you come off as pathetic and whiny? How much of this do your readers even want to hear about? I tend to err on the side of authenticity, but the critical thing for me is to be mindful of it. I was blogging long before I had any potential audience to consider, but it’s still surprising how even the idea of an audience matters. Now let the Q&A begin! 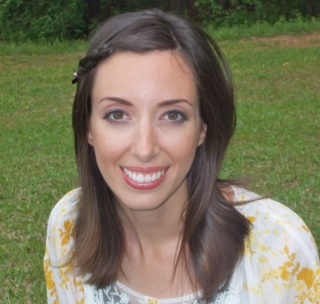 Jenn McGowan: What were the biggest differences between writing book 1 and writing book 2? And what are you working on next? Katy: Writing Book 1, I didn’t know what I was doing, but it didn’t matter because I didn’t really realize it. With Book 2, I knew I didn’t know what I was doing and it terrified me. But it was also so much fun to write in a completely different voice. Kitty, in GILT, is a bit complacent, an observer, introspective. Anne, in TARNISH, is brash and blunt and would never have tolerated any of Cat Howard’s manipulations. I’m currently working on a third book set in Henry VIII’s court—one that bridges the gap between GILT and TARNISH. It features entirely new characters, but people from both of the other books play important roles. J. Anderson Coats: Which of your characters do you most want to slap and/or take to task? Katy: I’ve got two replies to that one. Cat Howard is the easy answer. She’s selfish, manipulative, egotistic and has no foresight. At some point, someone should have taken her to task, though I’m not sure she would have listened. And I desperately wanted to slap some sense into Kitty Tylney before things fell apart. But it was like watching a train wreck, writing her descent into misguided loyalty. Ultimately, neither girl could change her own character. And nothing was going to deter them from their paths—chosen or not. Cat Winters: Now that the hardcover edition of GILT has been available for a year and the paperback edition is making its debut, what would you say is the most important thing you’ve learned about the publishing process? Katy: Roll with it and learn to let go. Pretty difficult for a borderline control freak and obsessive perfectionist. There is so much that we—as authors—don’t have any control over. What we can do is write the best books we have the capacity and skill for at the time. And keep writing. As hard as it is, and as much self-doubt as I feel, I know it’s the writing that has got me through the rough spots this past year. Renee Collins: What do you do to get inspired, or get in the right “mood” to write in your chosen historical era? Katy: I read a lot of non-fiction. I look not only for the events that I put into my books, but also for the details—tastes and smells and textures. But I temper that with modern music—songs that give me insight into my characters or reflect the mood of a scene. And when I sit down to write, I turn all of that off and hope the blend of the two come out on the page. Laura Golden: GILT spotlights a major historical figure, Catherine Howard, the fifth wife of King Henry VIII. How much of Catherine’s GILT persona is based on fact? Katy: Many of Catherine Howard’s actions in GILT are based on fact. Her escapades in the Dowager Duchess’s house, her whirlwind “courtship” with the king, and her eventual fall. But her persona? All imaginary. Think of it this way, if someone were to write down everything you did today—just the facts—would they really know what kind of person you are? I write a lot about clothes—colors, textures, fabrics—but if you were to look into my closet, you’d see a lot of black, thrift store specials and a few hand-me-downs. 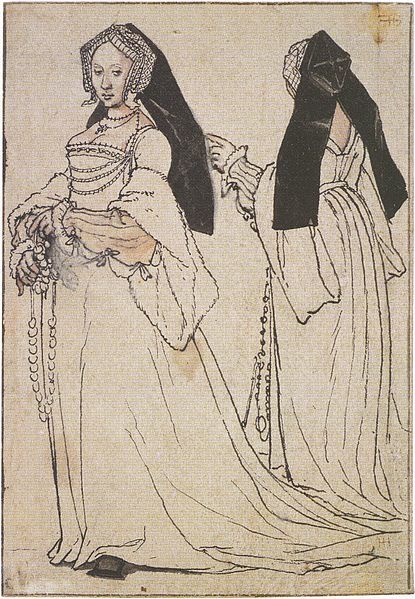 I think historians make a giant leap when they assume Catherine Howard was ignorant because she couldn’t write (many Tudor women couldn’t) and made bad choices or that she was an airhead because she liked clothes and parties. I used the exact same facts (she couldn’t write, she had lots of clothes, the king had fun and avoided politics while he was married to her) and gave her a character I thought would fit into that framework. Sharon Biggs Waller: What was the most interesting thing you discovered about the Tudor period? Katy: That it wasn’t nearly as romantic as books and movies make it appear. It was dirty and dangerous and ugly and our delicate modern noses probably couldn’t handle the reek of it all. Also that romantic love was still a pretty foreign concept and not something most people expected to experience in a marriage. But I’ve been “living” in the Tudor era for quite a while and it’s difficult to remember anything exceptionally interesting or bizarre. I’ve been here so long it all seems—dare I say—normal. Jessica Spotswood: I think my favorite thing about GILT is the fierce yet ultimately toxic friendship between Cat and Kitty. I suspect a lot of modern girls can relate to it. What was the most challenging or interesting thing about writing this complex friendship? Katy: When I first spoke to my editor on the phone about GILT, one of her questions was, “So did you have a friendship like this growing up?” My answer—fortunately—is no. I had (and still have) kind, supportive friends who accepted me for who I am. My experiences with people who are manipulative, critical, passive-aggressive and who purposefully abused my faults and foibles all came later when I had the skills and experience to be able to deal with it (mostly). So it was a challenge to make Kitty so blind to Cat’s true nature. What fascinated me about writing Cat, however, was how easy it was to come up with petty cruelties and exploitations. It’s one of the most wonderful things about writing fiction—being able to explore character traits, actions and faults that you hope never affect you in real life! Thank you for your fascinating responses, Katherine! 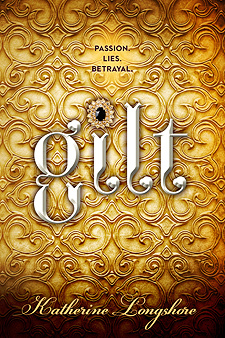 And endless congratulations on the paperback release of GILT!